Custom Robots.txt is a piece of code or information that let search engine crawlers know what to crawl i mean index from your blog and what it must don’t. So when search engine comes to your blog it first comes to Robots.txt File after that it moves to other areas of blog. So robot.txt file is piece of code that tell search engine crawlers what to index and what not. It’s like Traffic Police Warden it can allow or stop search engine crawlers from indexing certain areas of Blog. Robots.txt file interacts with all kind of crawlers or spiders like Googlebot, which is Google search engine's spider. In simple words, search engines always want to index the fresh content on the web so they send their spider or crawler to crawl the new pages on the web. If the spiders find new pages they will likely to index those pages, now robots.txt file comes to the picture on behalf of you, spiders or crawlers only index the pages you are allowing in your robots.txt file. Keep in your mind, the crawler or spider will firstly look at your robots.txt files to obey the rules you have instructed. If you have disallowed a page in your robots.txt file then spiders will follow the rule and they will not index that page into their search engine. Every time you create a blog in blogger a default robots.txt is created and until you change it by the setting is dashboard it remains same. It is same for each blog and it is Adsense friendly. If you are using a custom domain for Blogger the default sitemap will be http://www.technotricks.net/sitemap.xml. This Blogger sitemap is updated from previous ones. If this default robots.txt is able to satisfy your SEO need for the blog that you do not require to replace it by adding a custom one in by dashboard settings. 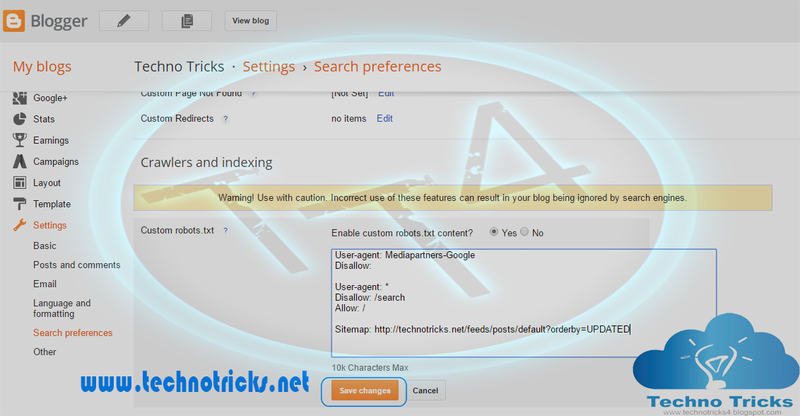 Note :- Make sure you add your blog URL in last line where it says Sitemap : and change your url after that. 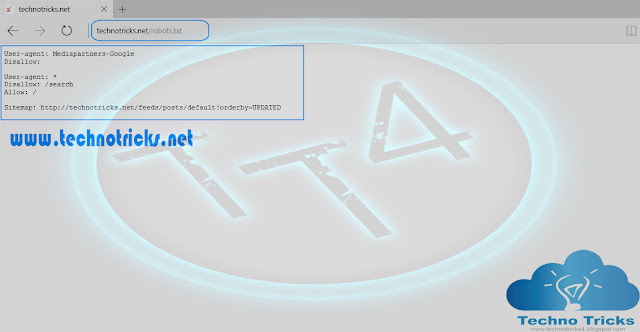 Now got to http://www.technotricks.net/robots.txt to confirm . 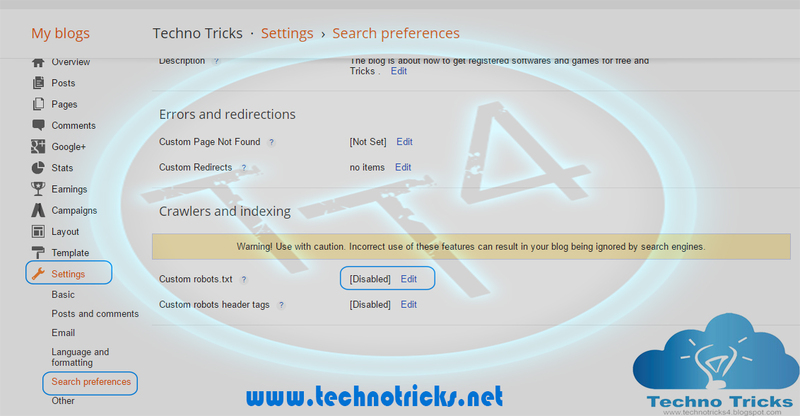 Note :- Change technotricks.net to your blog URL. That's it ! Your Done ! This is for all robots marked with asterisk (*). 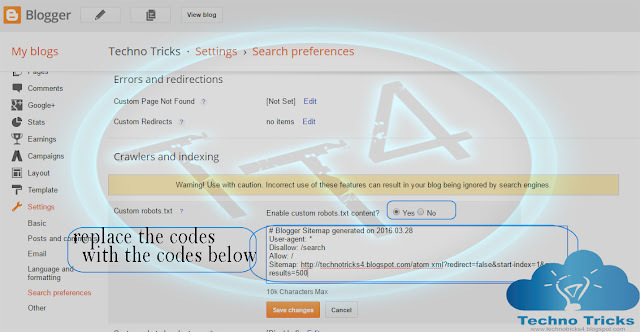 In default settings our blog’s labels links are restricted to indexed by search crawlers that means the web crawlers will not index our labels page links because of below code. So for those who are not programmers this piece of code tells spiders what to crawl and what to not. Disallow as name suggest doesn’t allow search engine crawlers to crawl certain area’s of your blog and search is for those pages ,labels in your blog that you don’t want to get indexed. That means the links having keyword search just after the domain name will be ignored. See below example which is a link of label page named Softwares. As the name suggest it allows search engines to crawl certain areas of our blog, in our case that is our sitemap, and sitemap includes our blog-posts. Don’t put any code in your custom robots.txt settings without knowing about it. Simply ask to me to resolve your queries. I’ll tell you everything in detail. Thanks guys to read this tutorial. If you like it then please supports me to spread my words by sharing this post on your social media profiles. Happy Blogging!